SIZE:General size, glove flexibility good! Gloves 1/2 Wrist diameter: 7cm,Stretch 7-8cm .Gloves 1/2 palm diameter: 12cm,Stretch 5cm. 6 pairs of garden gloves,4 pairs with claws and 2 pairs not. Best gift for your parents and friends. 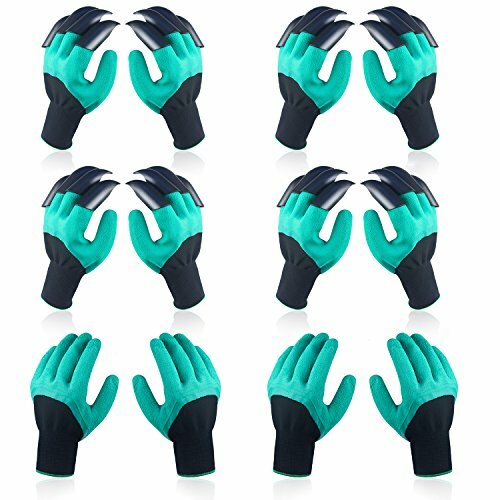 Huge Quantity: 6 Pairs - you will get 4 pairs garden gloves with claws and 2 pairs normal gloves here. Wide Application:With built in claws for digging, planting and raking, a big help while doing all your gardening tasks. Ideal Gift:Best gift for your parents and friends,which will make them happy. We will ONLY responsilbe for the customer services and refund,which are ONLY purchased from "Enjoyist".So pls be careful when you are shopping,if the products are NOT from "Enjoyist",we will NOT responsible for anything. If you have any questions about this product by Enjoyist, contact us by completing and submitting the form below. If you are looking for a specif part number, please include it with your message.